"I guess I lied about it being light at 7:30," Sierra told me as we pedaled groggily toward downtown Whitehorse in the pre-dawn cold. "I swear it was two weeks ago." "I'm sure it was two weeks ago," I said. Daylight fades fast this time of year; an entire hour can be taken away in two weeks time, and we were already facing more darkness and light. I could tell by the gray pall over the sky that it was significantly more cloudy than it had been the day before. I had planned for rain but really, really wanted it to elude me. This was, after all, my vacation. Not some endurance training death march. We parked outside a small convention center and lined up at crowded buffet tables, piling paper plates high with pancakes, hash browns and eggs. I suckled caffeinated beverages and juicy oranges and all of the warm fuel I could stuff down. I was randomly visiting Whitehorse on a Friday morning, and managed to line up my trip with a huge United Way fundraising all-you-can-eat pancake breakfast. What did I say about me and the Golden Circle? Lucky, lucky, lucky. It was a great way to start day two. And I really was feeling much better as I climbed away from the Yukon River and began the trek up the Alaska Highway. I had a tough day one, but I'm really not in all that terrible of shape for fast touring. I wasn't sore and my stomach was feeling much more calm despite the fact I had just eaten a large amount of greasy, sugary food (I usually try to keep my meals small and frequent when I am riding.) The rising sun filtered through breaks in the clouds and cast streaks of light over the valley. All around me were dark patches of scattered showers, but the road seemed to skirt all of them. I began to shed my layers as the temperature climbed comfortably into the mid-40s. Lucky, lucky, lucky. Most of the trees along the river valley were barren, the grass dry and the road covered in brittle, brown leaves. I smiled at the idea that in a single 24-hour period, I had managed to ride my bike from a region where fall was still in its half-green infancy - Skagway - to a place where fall was pretty much over. There still were patches of color among the grays and browns - holdout trees. Muted sunlight continued to find its way through an overcast sky. Traffic along the Alaska Highway was light, which surprised me. It is, after all, the main corridor between the Lower 48 and Alaska. But not that many tourists care to be up here this time of year. I can't figure out why. One aspect that really stood apart for me on day two was how much strength I derived from the effort of cycling. Rather than feel weakened by the passing miles, I felt empowered. GPS indicated a respectable speed average, and I could feel the pleasant burn of my quad muscles firing with every pedal stroke. It helps that the climbing was much more easy-going than it had been along the Klondike Highway. The air remained almost completely calm, and the breeze was a tailwind when it was anything at all. My pace continued strong, relaxed but determined, as I paralleled the snow-capped mountains that I would eventually have to cross again. But with no definite plans about where to stop for the night and everything I needed strapped to by heavy-but-burly bike, I could sit up high, drink in the subtle colors, and enjoy life in the moment. I stopped in Haines Junction for a late lunch, 100 miles already behind me and a mere 150 more to go. The comfortable routine of distance touring was sinking in, and 100 miles was already starting to seem like a short distance. I found a general store and walked around in a bike-addled haze, completely confused by the Canadian choices before me. Not only is everything wrapped in half-French labels, it's also weighed in grams, not ounces, and always seems to be just a little bit different than versions of the same food in the U.S. I wanted peanut butter chocolate chip chewy granola bars, but could only find raspberry ones in a box of six, not ten. I sought out more peanut butter cups, but they were horribly expensive given the equal exchange rate, so I settled on these strange giant Kit Kat bars, which offered more calories on the dollar. I couldn't find Clif Bars, so I bought almonds, then loaded up with fruit, vegetables, bread and Gatorade that I planned to devour at a picnic table out front before I headed into the remote, serviceless, "no fuel" wastelands of the Haines Highway. As I climbed away from town, I decided I would keep riding until dark and then find a good spot to bivy. Even though I was carrying a magazine, I didn't think sitting around camp as temperatures dropped below freezing would be all that fun, even if I did motivate to build a fire. No, I was going to ride to nightfall and then sleep good and long - after all, the darkness still consumed more than 12 hours of the day. Fall color began to return to the trees as I pedaled south. It was almost like moving back in time. By dusk, I was well beyond the spot where I camped last year - Kathleen Lake - and aware that I was somewhat close to a campground called Million Dollar Falls. The idea of trying to reach a campground was appealing. Yukon campgrounds are sometimes equipped with covered picnic areas, and I was still dodging rainstorms that soaked the highways and were starting to hit me peripherally as snow flurries. I decided to push for it. Darkness descended and the already extremely light traffic stopped altogether. My headlights cast an eerie white glow on the rough, wet pavement, which was glittering with flecks of ice. I began to develop an unsettling awareness of how alone I was. The old familiar feeling was frightening, almost debilitating, and to top it all off, the sleep monster had started to creep in. Ditches and small notches in cliffsides started to look like appealing places to take a nap. Still, I thought, the campground couldn't be far. My pace slowed considerably because I couldn't tell wet pavement from black ice. The road started to dip into some long descents, and I realized a crash out there could be especially dangerous, since another car was not likely to drive by until morning. I listened to the creepy squeal of my wet brakes as I death-gripped the levers, actually praying for the downhill to end. When I finally bottomed out, I pounded at full, red-zone throttle up the next long hill, sucking air just to burn off the residual fear. I ended up at a scenic overlook, with a wooden deck built over a hillside. "This is perfect!" I thought. "It will get me off the ground and there's even a bench I can roll under if it starts to rain or snow heavily." You might think it's strange that with all of that beautiful forest surrounding me, I would choose to camp on a deck. But it's vastly lonely out there, and like I child who can't give up her security blanket, I find myself clinging to any outposts of human civilization. I didn't know at the time that I was less than three kilometers from Million Dollar Falls. If I had ridden about 300 yards further, I would have seen a sign indicating the campground was two kilometers away. But the overlook wasn't a bad spot to bivy down. The time was just before 9 p.m. I looked up to the sky and noticed large patches of clear sky that were nearly whitewashed with millions of glittering stars. My GPS indicated I had stopped at about 2,900 feet - an elevation nearly as high as some of the alpine peaks around Juneau. None of this boded well for how low the temperature might dip overnight, so I bundled up in my sleeping bag and shivered nervously, hoping my heart rate would slow down for just a few minutes so I could fall asleep. I stepped off the ferry at 8 a.m. Thursday in a mental fog, vaguely aware of only two things - the morning could not have been more beautiful, and I could not have felt more awful. As the warm light of the sun rose into a bright blue sky, I regarded it with something that was almost like irritation. 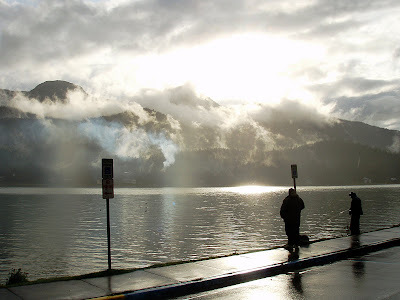 If it had been pouring rain, I might have been able justify slinking back onto the ferry and hitching a return trip to Juneau. I had slept restlessly Wednesday night on the floor of the ferry's top level, at one point waking up half out of my sleeping bag and completely drenched in sweat. It was as though my body had tried to expel a week's worth of sickness in one spectacular flash fever. It didn't know if it was nerves or if I really was getting sick. It felt like a little of both. I pedaled through Skagway, stopping at the grocery store to try to cram down some yogurt and granola. I was only able to eat a few bites and had to throw the rest away. It's not the way to start a beautiful day and certainly not the way to start a three-day fast-tour around the Golden Circle. It doesn't help that the way I was riding the route, backwards by almost all accounts, allows almost no time to warm up. I had three miles of fairly flat pedaling along a river before the climb began in earnest. The road rises from sea level to 3,200 feet in 14 measly miles - 11, really, if you don't count the flat "warm up." I took my first break at mile five, trying to calm all of my apprehension and bile with a little bit of big-picture perspective. But perspective was hard to find. Beautiful weather the day before had coaxed me into a five-hour hard hike, which not only ate up precious energy reserves but also precious time. I had little of that left to finish preparations, and had to cram so much between work that I didn't even take the time to eat dinner. Then I slept poorly while trying to overnight on a ferry. In short, I felt completely physically unprepared for the trip. The only way in which I did feel prepared was my gear. I had packed up the supplies I would need for cold rain and hard frosts and remote repairs and a big handful of spare batteries for my lights. I was admittedly way overpacked for a three-day trip, but I don't regret any of it. I was traveling alone in late fall in remote areas where eight-hour spans of silence can pass between the cars that go by in the middle of the night. I would rather be prepared for the worst than live on the edge of comfort and hope for the best. But I also, unfortunately, never trained with any kind of weight on my bike. So to suddenly load it up with a lot was a big shock. I don't know if it was all the weight or the crappy way I was feeling, but I had no power climbing up White Pass. I was still in the single digits of miles and already formulating a plan should I feel the need to turn around. A man I had talked to on the ferry, a Haines candidate for the state Legislature (can't remember his name), told me "the ride from Skagway must be great. It's a quick trip up to the pass and all downhill from there." No, I told him, there's a lot more climbing after the pass. My GPS later confirmed what I suspected. It's 3,292 to the pass, and more than 4,000 feet of elevation gain beyond it to Whitehorse, mostly on steep rolling hills along a seemingly endless string of lakes. Still, that first glance into the northern edge of British Columbia, with all of its breathtaking open space, will soothe any physical maladies, even if only for a moment. I tried to take in some more calories, relying on an old stand-by that always seems to go down easy no matter what: Peanut butter cups. The air was calm and stunningly clear. If I couldn't find a way to enjoy myself on a day like that, there really was no hope for me. The big picture perspective was starting to sink in. I dropped a few hundred feet to Canadian customs, where the border guard recognized me from the 24 Hours of Light. After I answered the string of seemingly ridiculous questions (I mean, really, what bicycle tourist carries alcohol, firearms and $10,000 in cash? ), I told him where I was headed and how long I planned to be in Canada. "Wow, you sure like to ride a lot!" he said. "I hope so," I answered. The afternoon was largely a struggle with the haze of low-level nausea, punctuated by startling beauty. The region was enveloped in the peak of fall colors, with winter creeping in from above. The views really were enough to keep me on task, namely, turning the pedals away from Skagway. I always wanted to see what was up over the next hill or around the next bend. The thrilling descents also always seemed to come along just in time to lift my spirits when I needed it most. If there's any one thing I've never failed to be on the Golden Circle, it's lucky. The hills around the endless lakes did threaten to break me; the bike I was pedaling felt like it weighed half a ton. But if there's anything I've learned about distance cycling, it's that eating will almost always make me feel better. Physical stress puts my emotions at such extremes that I could be on the edge of despair, and a simple peanut butter cup would quickly lift me back to normal, where I can continue pedaling to the brink of elation. So I used the miles to slowly recover, knowing I had a lot more ahead of me. And there were plenty of calm, quiet moments, when I stopped thinking about my sour stomach and my blood sugar and my heavy legs, stopped worrying about elevation and destinations and miles, and simply let the landscape carry me, sometimes deep into the past, sometimes into my hopes for the future. I was near a low point again when I reached the town of Carcross, still only 65 miles into my 370-mile trip. I chugged some Gatorade at a gas station and limped up to the "Carcross Desert," which is actually not a desert at all but a large deposit of silt left behind by a long-faded glacier. Still, I take a lot of strange comfort in these dunes. They remind me of a far-away past, of my home. Much like I did a year before, I stopped in the desert, set down my bike, and laid all the way down in the cool sand. I breathed deep as grains of sand crept around my arms and neck until I felt like I was dissolving into it. I also was locked in physical distress when I stopped here one year before. Only then, I was facing the last 65 miles of my trip, not looking back on the first. But just like last year, the softness of the sand was rejuvenating. I could look around at the big picture again. I also realized that if I did not pick up my pace, I was going to be pedaling to Whitehorse well after dark. 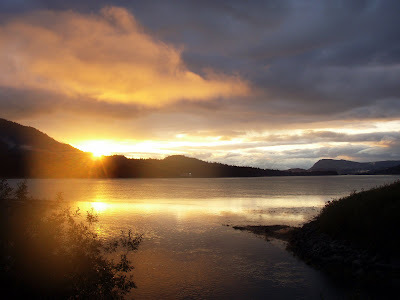 After 45 miles of subdued but determined pedal-mashing, I finally arrived in town right at dusk - about 7:30 p.m. Alaska time. It was 8:30 in Whitehorse, and my friends Sierra and Anthony had waited up for me, holding out on dinner the entire time I dawdled into town (I had told them, very optimistically, that I would be there by 6.) Sierra cooked up a delicious northern delicacy, moose stew. "Everything was grown and shot right here in the Yukon," Sierra told me. She made it with potatoes and greens from her garden, and moose meat from a co-worker. Sierra and Anthony are really great. I always manage to stop by when I'm completely wrecked, and they make everything better with amazing homemade food and a warm bed and real understanding, because they do all this crazy bicycle stuff themselves. I went to bed telling myself I would feel much better in the morning, and believing it. "So you just sort of go it alone?" my friend asked when I explained to her why I wouldn't be able to attend her gathering this weekend. "Yeah, that's kinda the idea," I said. "Why is that the idea?" my friend said. "Well," I said. "For starters, it's pretty hard to convince other people that riding a loaded bicycle 110-150 hilly miles a day in the cold is a good time. And, anyway, I'll be visiting friends along the way and maybe even talking them into riding some of the route with me. For the rest of the trip, I'll just have all sorts of time to really think about things." "What do you think about?" "My life, my goals, stuff," I said. "These tough trips really help me separate what's important from the general fluff. Although, I have to admit, I usually end up spending a bulk of my riding time thinking about food and sleep." "Yeah. Yeah, I'm scared. But mostly of bears and weather and scary people. The loneliness isn't so bad." 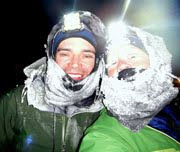 Geoff woke me up this morning with a quick call to inform me he was no longer planning to run the Bear 100 on Friday. "That sounds like the smart plan," I said. "What made you change your mind?" "I'm still fighting off a cold," he said. "Plus, Dane and Jess invited me to go backpacking with them in Boulder (Utah) this week, and that sounded more fun. That's where we're headed right now. Reception is pretty spotty. I wanted to call before I was out of range completely." "But you already registered for the race, right?" I asked. "Didn't you spend like $200 on it?" "Yeah, but ..." The call cut out. I wondered what really made Geoff decide to dump his plans for the Bear 100. Dropping out because he had a cold on Wednesday didn't really sound like him. Was he scared? Less certain about his physical recovery than he let on a few days earlier? Or is it possible that he's making peace with the idea of moving back to Alaska? After I got off the phone with Geoff, I noticed what an amazing bright blue day Wednesday was shaping out to be. I had promised myself I would take the day off. I have 370 miles to ride in the next three days, and none of those miles are likely to be easy. But, as I looked outside, I thought that some days, resting the body is not as important as stimulating the soul. Most days are like that. Luckily for me, in my nervousness about preparing for my bike trip, I had finished packing on Tuesday night. So I had little else to do Wednesday but eat and work and wait for my ferry to pull into port. I headed over to Mount Roberts for the second time this week, in favor of "easy" trail and lax hiking. However, I tend to forget how energizing a clear day can be, when heart-stopping beauty stretches out beyond the farthest reaches of my vision. I'm gripped with a desire to push and push and push toward the horizon until it ends, knowing it never will. That's how I ended up on top of Gastineau Peak again, feet almost floating atop a couple inches of new snow, facing east toward a snow-capped skyline that continues into Canada. I looked down the ridge at a healthy coat of termination dust that may be here to stay and thought, "It's still early. If I don't bag Mount Roberts today, I'll likely not have another chance this season." So down the ridge I went, the joint-jarring consequences of a long hike unacknowledged. And I was so glad I went to the top of Mount Roberts. To just stop and turn off my iPod and listen to the frigid wind and the absolute silence of solitude. These are the moments I wish I had more opportunities to share with my friends. But there is also he sense that the reality of listening to someone rip into a PowerBar or complain about the cold might just crush these fleeting, perfect moments. And then there's Geoff, who on a gorgeous day like Wednesday, would probably just do all the things I can only dream about doing while I stand on peaks. I could picture him running the crest of the entire ridgeline until he looped back into town. It's too bad he doesn't really like Juneau so much any more. In the time I've spent alone this fall, I've worked on formulating a concrete reason why I can't leave Alaska. And what I've come up with is, over the past three years, I've never known a period in my life in which I was so consistently inspired. I started writing again, a hobby I had all but given up on, and developed a passion for something I never even used to think was all that interesting - photography. I've honed my physical fitness to levels I never imagined and forged my new skills into something even better ... inner strength. I think often about my life before Alaska, a life Geoff actually had to drag me away from, kicking and screaming. I was once scared of nearly everything, but I was especially scared of being alone. My life revolved around late mornings at the Apple Fitness club, afternoons and evenings at work, and late nights with my friends, sometimes out until sunrise. I thought I was happy. Then I moved away from it all, and learned I hadn't been happy. Now I am afraid to go back. How can I leave Alaska? Alaska is my muse. When Geoff told me he registered to run the Bear 100 this weekend, he said he mostly just wanted a good, hard effort with the alone time he needed to think about his future. I told him that's the same reason I wanted to ride around the Golden Circle again. Now he's backpacking in the desert and I'm still planning to pedal into the Yukon, a vast amount of space in which to think, and a vast number of miles to ride on less rest than I should have given myself. But I look forward to all of it. I leave soon to catch the 12:15 ferry. Wish me luck. I loaded my bike today with food and gear and set out to see how she handled. I quickly noticed the extra weight on climbs, but, as usual, started to forget about it as I coasted along the road in the crisp fall wind. I love packing up my bike with everything I need to live. There’s freedom and joy in the knowledge that I could ride to the end of the day and just keep going. So my preparations are nearly complete for my spontaneous fall Yukon tour. I am starting to feel pretty nervous about it, which is a good thing. To me, being scared is a sign of a worthwhile adventure. The weather forecast for the area is calling for highs in the 40s and lows in the 20s with a moderate chance of precipitation on Saturday. I am hoping any precip falls as dry snow flurries if it falls at all. If I run into freezing rain, I may have to turn back or hole up for a bit. This trip is the same route I rode in 48 hours in August 2007. During that trip, I clocked the distance at 371 miles. This time, I will have 72 hours between ferries to complete the tour. I also will be riding the route backwards, due to the only ferry schedule that worked out for me. It will be fun to see the Golden Circle from a whole new perspective, but I do have reservations about riding from Skagway to Haines. For starters, the climb out of Skagway gains 3,000 feet in 11 miles, as opposed to the same elevation in about 60 miles out of Haines. With all of my extra bike weight, that probably amounts to two hours of climbing in the red zone right out of the gate. Then I still have nearly 100 miles to ride into Whitehorse over the rolling hills that follow the headwaters of the Yukon River. Day two will be the Alaska Highway, with mild rollers, more traffic, and, as I learned last year, very little water. When I rode this stretch in August 2007, I encountered temperatures in the 90s, oppressive sun and a steady headwind. What a difference a year and a month can make. This time, I will be happy if temperatures are in the 40s; happier if it’s dry; and even happier if the stiff wind is blowing in that same general direction. Day three will likely be the longest and most remote stretch of the trip. I’d honestly rather get this leg out of the way on the first day rather than the last, when I haven’t seen a weather report in three days and have less options if I need to turn back. I will be watching the sky closely as I distance myself from Haines Junction, because I don’t want to be caught out there in a blizzard. Once I round the summit of Haines Highway, I’m nearly home free. 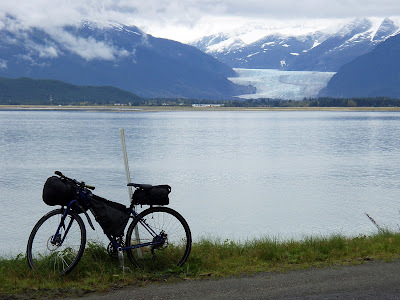 It’s a quick drop back to the U.S., followed by a nice, flat meander along the Chilkat River that I’ve ridden several times before. So that’s my tour. I have to overnight on the ferry on Wednesday, and I set out first thing Thursday for the hideous climb into Canada. I’m nervous! I know from experience that once I settle in, I’ll likely feel happy and content, with nothing to do but sleep, eat and ride my bike. But the days leading up to a big ride are always hard. I headed up to Gastineau Peak and Gold Ridge today. I did a little meandering and a little dawdling, and ended up burning nearly five hours of daylight on the mountain in the morning/afternoon. I have been consuming a lot of my free time lately in "long" outdoor activities and evenings with friends. I am really starting to feel the fatigue of never being at home, which is interesting, because I have been battling a raging wanderlust that also seems to be burning holes in my contentedness. But it was a nice day on the Mount Roberts trail, with rolling clouds and flecks of sunlight. There were no cruise ships in port this morning, which meant the tram terminal was closed, which meant I didn't see another soul on the mountain until I passed two fellow "through" hikers (both solo) on the way down. I did see a coyote, which shadowed me at a safe distance for quite a while. I'd stop and the coyote would stop, and we'd just stare at each other for a few seconds until finally, I got bored first and started walking again. And sure enough, the coyote walked along with me, although much higher up the ridge. It was interesting to see an animal so curious about a human in the area just above the tram. 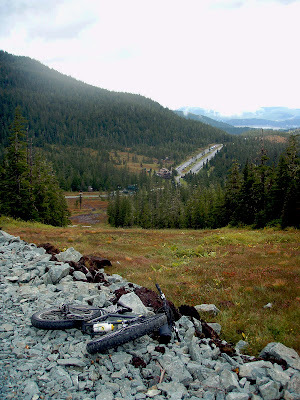 Mount Roberts has to be the most heavily human-populated trail in Juneau, at least in general. But not today - it was just me and the coyote, and a whole bunch of ptarmigans mottled with new white winter feathers. This picture is about as far as my little camera can zoom, so you may have to take my word that there's a coyote in there. Requisite picture at the peak, just as the low-lying clouds were finally starting to clear up. I brought mittens and a hat today, which is good, because light snow flurries brushed the ridge for most of the morning. It was a good way to spend the last "long" day of the year. Monday is the autumn equinox, and with it equal hours for both day and night across the globe. Then in the northern hemisphere, we begin to slip into darkness. And here in the far northern hemisphere, we slip into a lot of darkness. I don't consider that a bad thing, just different, a new way of seeing things, a new adventure. So by the grace of Gastineau Peak go I into autumn, into the first long night. Then there was the morning ride with Terry up to Eaglecrest. I was trying to break in Pugsley, who has had a pretty lax summer, for the everyday grind with nice, steady climb. Sunlight filtered through the clouds all morning long, and the sky was just clear enough that I could see the mainland from the ski hill for the first time in ... I don't know ... weeks at least. So I walked downstairs to buy a Diet Coke from the vending machine and snapped a few more photos. I left work for my lunch break right around sunset. Before I drove home to make myself dinner (I promise it wasn't Honey Bunches of Oats), I stopped at the Salmon Creek inlet and stood by the highway bridge, just drinking it in. 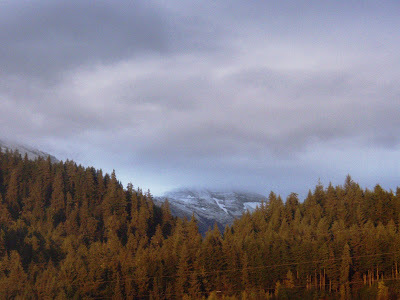 All the while, right behind me, Observation Peak loomed with a healthy coat of new snow. I thought about how much I would love to be up there at that exact moment, feeling my heart pound and lungs burn in the alpine air while the sun cast an orange glow over snow-dusted boulders. Why, I thought, why couldn't the summer of 2008 just have given me a single 10-hour weather window while I wasn't at work to climb that peak before winter set in? And yet, as I stood next to the highway and my office building and an industrial-zoned section of Juneau all bathed in golden light, I didn't feel too bad about it. I can't climb mountains every day, but sometimes everyday life is just enough. I've had this rigid fork since I got the bike - it was the fork that came with the frame. I stuffed it under my bed in favor of a Reba suspension fork, but kept it around so I could switch it out for winter riding. Since winter is all but here, I figured I could get a jump on it and switch the forks now. It'll mean riding rigid on trails for the rest of the fall (likely on my Pugsley). But it should also be a better fit for my Yukon tour. I also bought these "skinny" touring tires to roll better on pavement but also chew up the potential gravel and mud without too many problems. If there's a lot of ice and snow out there, that's another thing. But if there's a lot of ice and snow out there, well, that's another thing. But that's also why I started to think more seriously about bringing all of the camping gear I'd actually need to spend a night out, and not just relying on Sierra and Anthony and Yukon motels. I was also thinking more that as long as it's not raining, a campout along the Haines Highway may even be fun. So, basically, I outfitted KiM with svelte new tires and a sleek new fork and then packed her up like a pig. On the handlebars I have a North Face sleeping bag rated to -20, a 3/4" Thermarest and a Black Diamond winter bivy sack. The seat post bag has a spare tube, my rain pants, an extra base layer, a down coat, mittens, extra socks, a balaclava and some thermal pants (did I mention I'm expecting winter weather?) All I have in the frame bag right now is my water filtration bottle (I'm planning to carry the rest of my water on my back.) There's obviously a lot more room in there than what I'll need to carry a day's worth of food and the miscellaneous other things I'll need, so I may rethink the packing up front or in back. Or I may just carry more stuff than I need. Nothing wrong with that. The front bag may look like it would really mess up the handling, hanging off the handlebars as it does. I rode it around my block a couple of times and didn't notice any problems. I'll probably take it out for a longer ride when it's drier just to make sure. I think everything put together in that bundle weighs only about five or six pounds, so it's more bulk than weight. There's also the consideration that I will be riding exclusively on roads, so the handling can be more sluggish without problems. Although it does seem a shame to blast right by the mountain biking capital of the north and not even hit up any singletrack, I simply won't have time. All of my bike bags are the same Epic Designs bike bags I used on my Pugsley in Iditarod Trail Invitational last February. The front bundle was specifically designed for my pig of a minus 40 degree sleeping bag, so it doesn't cinch up as tight as it could over the "small" minus 20 degree bag, which is why I'm getting some bulging (the clearance is still fine.) The frame bag is also too big for the Karate Monkey. But beyond that, all of the gear transferred really well between bikes and different uses. I should mention that Geoff used that exact frame bag and seat post bag during the Great Divide Race. Epic Designs: It's the gift that keeps on giving. I feel really excited about the prospect of this trip. I should feel more nervous. I did the exact same bike tour a year ago and spent two months preparing and training for it. But what a difference a year can make ... I know a lot can go wrong and it will be hard either way, but I feel a lot more confidence in my abilities, in dealing both with the physical challenge of the mileage and the psychological challenge of the remoteness. I rode my touring bike out to the end of the road today as the mechanics at Glacier Cycles were working on KiM. 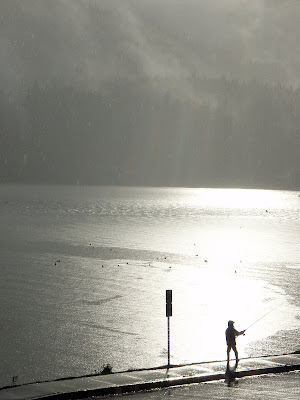 It was one of those days where I rolled into Echo Cove and despite steady rain and cold wind gusts, I really wished I could just keep going. Sometimes, you just need those open miles. Sometimes they just call to you. I set out to traverse the Juneau Ridge today but got shut down, again, by cold and clouds. I can't believe that summer is over and I haven't even hiked the full Juneau Ridge yet, let alone Observation Peak or a Blackerby-Juneau and/or Juneau-Roberts epic. It's definitely been a dud of a season as far as my mountain ambitions go. At least there were good colors today, despite the flat lighting. Autumn is actually past its peak at higher elevations. It won't be long now until snow settles in to stay. Ebner falls, with autumn just starting to emerge at lower elevations. I mostly took this picture as an excuse to take a break during the lung-busting climb. 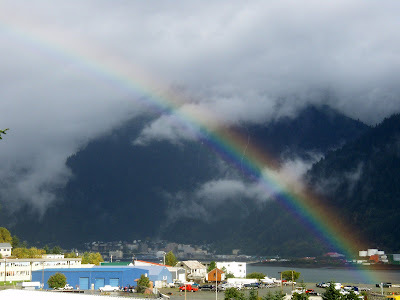 Ah, the city of Juneau. Next week will be the last for cruise ship visits. The first day the cruise ships stop coming is always a strange one, because the population suddenly drops sharply, the downtown shops close up all at once, and I no longer ride by tour buses full of people all staring out the window (the people on city buses never look out the window). It's a nice, quiet time of year, but there's a sadness to it, too. The always photogenic first pitch after Mount Juneau. As I crested the peak and started to descend the ridge, I had to fight this wild, frigid crosswind. It pushed with enough force that I felt like I was about to blow off the mountain. Based on past experiences with strong winds, I'm guessing the wind was gusting 50 to 60 mph. The temperature at 3,500 feet was maybe 40, likely high 30s, which would put the windchill at about 20-25 degrees. It felt like it! I wore only a fleece pullover, a rain jacket and no gloves, so every gust blasted me with wintry cold. I knew there was no way I was going to spend two hours traversing the ridge in that kind of wind, but I had hiked all the way up there and thought I should at least enjoy as much of the scenery as I could bear. That turned out to be 45 minutes out, and a fairly uncomfortable 45 minutes back. But that was mostly because I stopped long enough to set up my camera's self timer twice. I just wanted a portrait picture with the crimson-colored tundra. This is the failed shot, because I didn't turn around in time. But now that I look at it, it turned out to be the better picture. As expected, the clouds finally sunk below the ridge line, so it was a good thing I aborted my mission. After my Blackerby Ridge experience last month, I'm terrified of getting lost on ridges in the fog. It would be even worse to be lost when I'm already uncomfortably cold and wearing every piece of clothing I have with me. Fall is here and winter is coming, so I have to remember to prepare better every time I go outside. It's a harsh, hard time of year, but it never fails to be interesting.